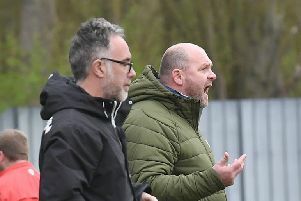 Wyberton manager Joe Greswell conceded that a ‘criminal’ first-half display cost his side a place in the Mason Bros Lincs Junior Cup final. Although the Colts netted twice after the break the damage had already been done as they lost 3-2 at Brigg CIC, the hosts progressing to face Horncastle Town in the final. “Coming here was always going to be hard, but to gift them a 3-0 lead going into half time was just criminal,” Greswell said. “We had half chances and had periods we looked like we could nick one, but it wasn’t to be. “Second half no complaints, we were brilliant, but just a little too late. Wyberton got off to a poor start as they found themselves 1-0 down after 10 minutes. The Brigg midfielder picked the ball up and skipped past three players before playing a lovely ball to his forward, who placed it past the oncoming keeper. It got worse as Brigg made it 2-0 from the penalty spot. Wyberton finally came into life and started making chances, but after two golden opportunities were squandered disaster struck. A poor clearance landed kindly for a Brigg forward who made it 3-0 before the break. Wyberton came out fighting in the second half and soon got themselves back in the game, scoring twice in the three minutes after the re-start. Left back Janson Pinner crossed a ball to the back post which beat everyone and found the top corner. It got even better for the Colts as they made it 3-2 from a corner, Scott Dawson heading home. Brigg calmed things down and found their stride once again, slowing the game down. Wyberton hit the post with 10 minutes to go and Daniel White saw his header saved from inside the six-yard area as it finished 3-2 to the Zebras. The two sides will meet Lincs League action on Saturday s Brigg visit The Causeway.